Don't use cold, wet weather as an excuse to stop riding. 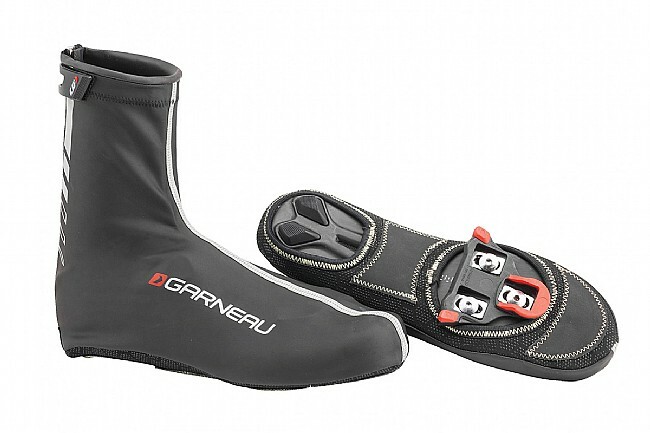 Keep your feet warm and dry with the insulating protection from wind, rain, and low temperatures with the Louis Garneau H20 II Shoe Cover's blend of water-repellent, durable, and insulating fabrics. Featuring a nearly entirely closed bottom to block out moisture and allow for easy walking, these shoes are designed for winter riding. Neoprene cuff: Better fit that prevents infiltrations. Under sole: 2 openings with textured neoprene and reinforced rubber for enhanced durability. Rear opening: Rear zipper with zipper protector for easy slip on/off. HiViz360: Reflectors at rear, front and sides for optimum visibility. They are a little snug pulling over size 49EU wide bike shoes which is to be expected. My only ding against these is that the top velcro strap that closes them above the ankles is too narrow and can cause some rubbing if I'm not careful in how I affix the closure. They are made for skinny legs. Otherwise they keep my feet dry and warmer on those winter rides. Great covers. No water penetration. Zippers are great.